The Smithe is a new condo development from Boffo. Located at 225 Smithe Street, between Smithe and Cambie Street. A prime Yaletown location with The Keg, Earls, Parlour, and Yaletown Brew Pub and more right at your doorstep. Recent developments along the east side of West Georgia will only bolster the overall popularity of the area. 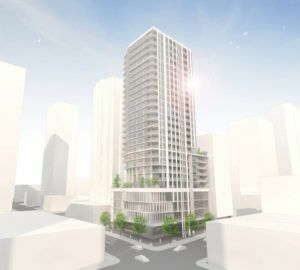 The Smithe is slated to be a 26 storey mixed use condo development. It will consist of 100 1, 2 and 3 bedroom units. It will also include 7 exclusive penthouses with over 2000 square feet of living space and their own private patios. The Smithe will use the ground floor as retail space, and will also include 3 levels of office space. Prices and floor plans have not yet been released. It is expected that prices will be released in the summer of 2016. We are still awaiting to hear what type of amenities will be included. Boffo has a reputation for high quality and detailed finishings and is expected to be a sound, high quality building. Although it is Boffo’s first attempt in the Downtown area they have had tremendous success across other parts of the lower mainland with over 45 years of experience. The Smithe is expected to be completed by the Spring of 2018.